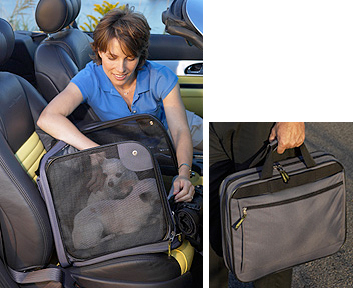 Comfortably holds small-med pets up to: 13 lbs and 13” high at the shoulder. Fully Enclosed to safely contain your pet without the need for leashes or harnesses. Same roomy compartment as the Auto Cruiser but handy portfolio sized case, without the lower suitcase portion. A modern spin on the classic standard of American bike baskets. The Auto Cruiser Pet Car Seat is a fully enclosed car seat designed to keep your pet comfortable and secure. 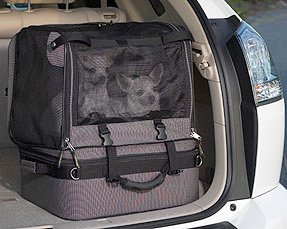 The pop-up compartment safely elevates your curious pet up over 10” for a wide field of view. If you prefer you can simply unzip the top and allow your safely restrained pet to look out the window as you cruise around town and beyond. Can also be used as a handy pet carrier and has plenty of storage space in the suitcase below for both you and your pet’s travel essentials. Cruiser attaches securely to your car’s seat belt. Whether you are taking a road trip, visit to the vet, or just cruising town, enjoy Pet Cruiser today! Includes a Wheel Kit that converts your Auto Cruiser to a rolling portable carrier for the airport, mall or anywhere you and your pet may journey. The Auto Cruiser holds pets up to 13" tall. Height: Measure from the floor to top of the shoulder (Withers) and that measurement should not exceed 13". Length: Measure from the nape of the neck (where the collar fits) to the base of the tail, that measurement should not exceed 13". • Safe, comfortable, durable padded construction. • Booster seat design elevates your pet by over 10”. • Three sided screening allows EZ-flow cross ventilation. • Auto Cruiser secures to seat by Velcro® seat belt snugger. • Top unzips and can be rolled down so your pet can enjoy fresh air and a look around. • Two zippered side doors for easy access from each end. • Quick snap pet safety belt attaches to your pet’s harness or collar. • Roomy exterior cargo pocket for leashes, collars, treats etc. • Removable and washable comfy fleece liner pad. • Oversized self repairing zippers & locking pulls for security. 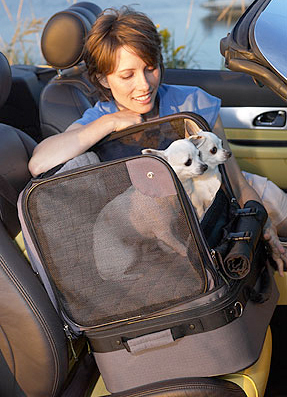 Never leave pet unattended in the Auto Crusier Pet Car Seat. CAUTION: Never leave animals confined and unattended in direct sunlight, without ample ventilation or where there is a risk of overheating. Be sure to secure your pet with the harness. PLEASE DRIVE RESPONSIBLY! • Includes two detachable; snap in, 9"H x 13"W zippered bag travel kits (one mesh and one plastic) for food, treats, toys and other pet essentials. • Easy zip side pocket to access items in suitcase, while in car seat mode. • Carry/tow strap (which is included) attaches onto strong “D” rings. Strap can also double as a quick leash. • Includes (4) 2.5" removable multi directional ball bearing wheels. • Portfolio version similar to above, less the suitcase option. Available in Gray. Purchase via Credit Card or Paypal. All transactions handled by PayPal. PayPal membership not required. Most products ship within 24 hours. Click here for more shipping information. • Comfortably holds small-med pets up to: 12- 15 lbs. Up to 13" tall at the shoulders. • Folds down to 9” in height to comply with most airline carry on standards (but not designed for airline pet travel unless your pet has his own seat. Enjoy safe auto travel with your pet today! Imported, Patent Pending. Copyright © Midnight Pass Inc. 1998 - 2010. All rights reserved. Patents issued and pending. This Website is Protected by the Copyright Laws of the United States of America. More Information.